While I’m all about fancy foods and impressive dishes, sometimes it’s hard to beat a good casserole. When I’m craving comfort food and want something that’s easy to make, I turn to a classic: shepherd’s pie. Although it’s usually made with lamb or beef (hence the name), my favorite filling to make a ‘meaty’ dish is seitan (say-tan). This wheat gluten-based food is packed with protein (actually more than tofu) and touts a short, recognizable ingredients list that you can feel good about. Best part? By making a vegan version of this often over-indulgent dish, each serving comes in at just above 200 calories. I was lucky enough to have Sweet Earth reach out and send me a goodie bag packed to the brim with their multiple seitan products. Their varieties come in different cuts (strips, slices, or grounds) and there are even flavored versions, all of which are delicious. For this recipe I used their ground seitan, which holds up well in the rich gravy and gives a savory boost to the dish. Steam the frozen vegetables and and pour into a 9×13-inch casserole dish. In a large pan, bring the olive oil to medium-high heat. Add onion and sauté until translucent and fragrant. Add garlic and cook for 1 more minute. Stir in mushrooms and seitan, cooking until the mushrooms have become tender. Add the seitan mixture into the casserole dish. In a separate bowl, whisk together water, milk, soy sauce, nutritional yeast, Italian seasoning, pepper, and cornstarch. Add the sauce mix to a large saucepan and bring to a simmer, stirring often. Cook for 3-5 minutes, until thickened. Pour the gravy over the vegetable and seitan mixture and stir together. Spread prepared mashed potatoes on top and cover the dish with foil. Bake for 45 minutes, remove foil, and bake for 15 more minutes. Sprinkle more nutritional yeast on top, if desired. Our next day in Philadelphia we hopped up and decided to take a long walk. Along the way we stopped in to see Elfreth’s Alley, which is the nation’s oldest continually inhabited street. The main goal of our walk was to reach Soy Cafe, which I couldn’t resist due to the name. 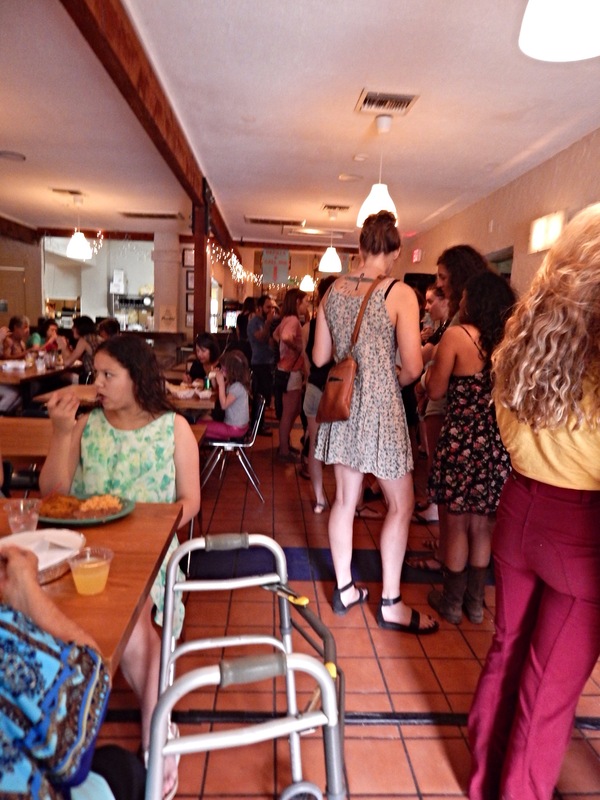 It’s a tiny little cafe with a relaxed attitude and a ton of vegetarian/vegan options. I’m not usually a smoothie fan, but threw caution to the wind and got a Cookie Monster smoothie which had oats and vanilla in it. It was kind of like an oat-y tasting milkshake, which I thoroughly approved of. Peter got the Milli Vanilli (click here if you don’t know the duo this smoothie is named after) which had peach, banana, and vanilla in it. I was intrigued by wasabi hummus on the menu, so I got a hummus, avocado, and tomato sesame bagel! Guys, this was so good. I would have never (and I don’t know why not) thought to put wasabi in hummus, but now I’m definitely recreating this recipe at home. I mostly got the wasabi flavor with almost no heat, and it tasted like a bread-y sushi roll when combined with the avocado. Peter’s love of eggs held strong and he got a portabello mushroom omelette which came with a side salad. He gobbled down the omelette and described it as “Good and creamy, even though it’s soy cheese.” Which what else he expected from someplace with “soy” in the name, I’m not exactly sure. The side salad was a flop that we left to wilt though, because (while beautifully presented) the ginger dressing was very lacking in flavor and a bit too thick to mix in properly. After brunch we visited the Eastern State Penitentiary, which is a looming remnant of the world’s first penitentiary. We got the audio tour and spent nearly two hours wandering around this behemoth of a building, hearing about both the good and the bad of it. Also Steve Buscemi narrated the tour, so props to Eastern State for the good choice! Even though there were other visitors, for the most part Peter and I had large sections of the building to ourselves. This resulted in some eerily quiet moments. The most moving part of the tour was this art installation “Other Absences” by Cindy Stockton Moore. The artist painted images of victims murdered by those who ended up living in the Penitentiary. The artist also wrote about how she had a very hard time finding photographs of victims who were minorities or lived in poverty, leaving her with no way to paint them or visually honor their memories. On a lighter note, a funny part of the visit was seeing Al Capone’s cell, which was dressed to the nines. The famous gangster, who was arrested for carrying a concealed weapon, spent his first ever prison sentence in relative luxury. Just like with the Magic Gardens, I had way too many photos to share. So here are just a few highlights from our visit. Next, we wanted to see around the Christ Church Burial Ground, which was sadly locked up. I’ve honestly never seen a cemetery that closed during the day or that charged money, so we left confused and disappointed. At least Benjamin Franklin’s grave was close enough to the fence that we could throw a penny onto it (because of his classic quote “A penny saved is a penny earned”) before leaving. We spent more time just wandering around before heading to Blackbird Pizzeria, which has the reputation of having the best vegan Philly cheesesteak in town. The place was small and the staff a bit curt, but the food here was the best meal we had on this stop of the trip. Although I never ate them in my pre-vegan days, I really love buffalo wings. We decided to order several things off the menu with the plan to take leftovers back to the hostel for a late snack. I made the mistake of assuming I could take the heat, and I ordered the smoked habanero wings. Now, before I get into the gory details, these were the best wings I’ve ever had. They were fried seitan with a crust that stayed crunchy despite the sauce and had a chewy flavorful inside. The dipping sauce that came with them was cucumber based and really deliciously creamy, but even that couldn’t save our mouths/esophaguses. The wings weren’t so hot that you couldn’t taste anything (which I always hate) but you could taste the smoky flavor with a heat was so intense that I had a few tears rolling down my face by the finish. In the end (in this meal and when we took part home) we went through four containers of the creamy sauce to survive. I can say I’d happily order these again, but I’ll probably plan ahead and bring a half gallon of soymilk along next time. Peter is always happy with pizza, but when he naively said “Just two slices of the haymaker pizza.” I don’t think he expected them to be this large. The kind he chose came with seitan sausage, garlic butter, onions, and Daiya on top. 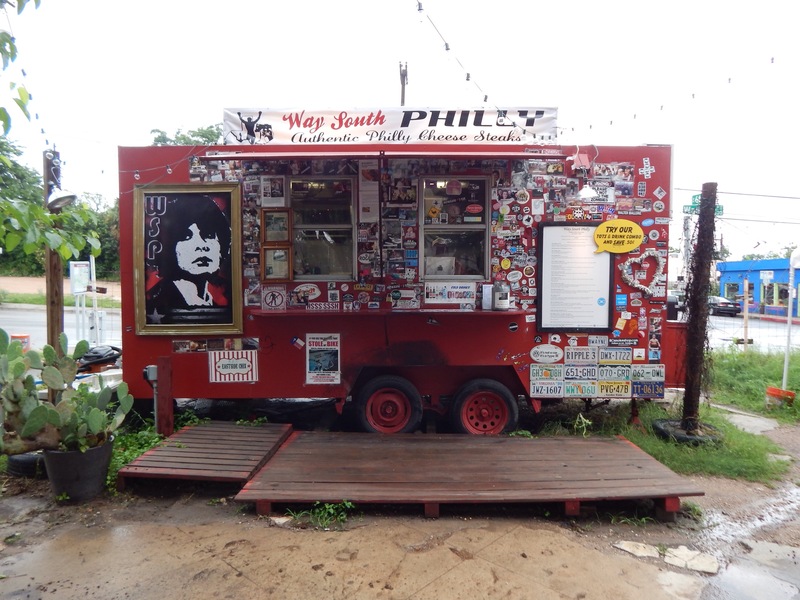 Eventually, after sharing bites of the wings and pizza, we got around to the reason we came here: the Philly cheesesteak. As a disclaimer, I’ve never had a “real” cheesesteak, but I’m pretty positive this is close to the real-deal. The seitan was thinly sliced and seared with garlic, rosemary, peppers, and onions. 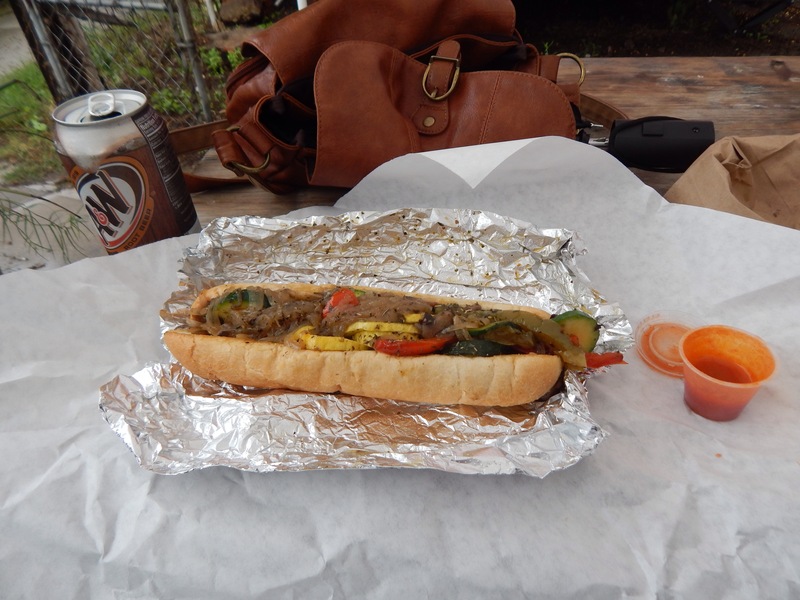 The accompanying cheese whiz was creamy and oozing out the sides of a thick and chewy buttered hoagie roll. So freakin’ good. I could only eat a few bites because of our previous snackings, but Peter ate a whole half. Throughout he kept exclaiming how much better it was than Carmen’s from the day before, which meant that Blackbird’s version must be amazing since he had just been talking about how he wasn’t sure you could find a better vegetarian version in town. Philadelphia was our first stop for our winter vacation. We got an awesome deal using Spirit airlines within certain dates ($40 total for both of us one-way) so we just chose to visit someplace we’ve never been! We flew in at night, so we started out early the next day to get a feel of the town. I actually took so many photos and we saw so much cool stuff that I had to break the Philadelphia part of the trip into two blog posts. We stayed in Apple Hostel, which is directly in the center of town and great for walking every place. We were five minutes away from the Liberty Bell and really close to a PHLASH bus stop which will take you to all the “must visit” spots in Philadelphia. The first thing on our list was some American history. We visited the President’s House which is a recreation of a mansion used by George Washington and John Adams in the 1700’s. You could see excavation sites where original parts of the house are still present. Right next to the President’s House is the Liberty Bell Center. It was free and only took a moment to get in through security, so it’s worth a quick stop if you’re nearby. We took the time to read the informative displays, most of which were interesting, but others were a bit extreme with patriotism. One part described how emotionally inspired Americans are by the Liberty Bell and how soldiers have sacrificed themselves in war as they thought of the Bell. 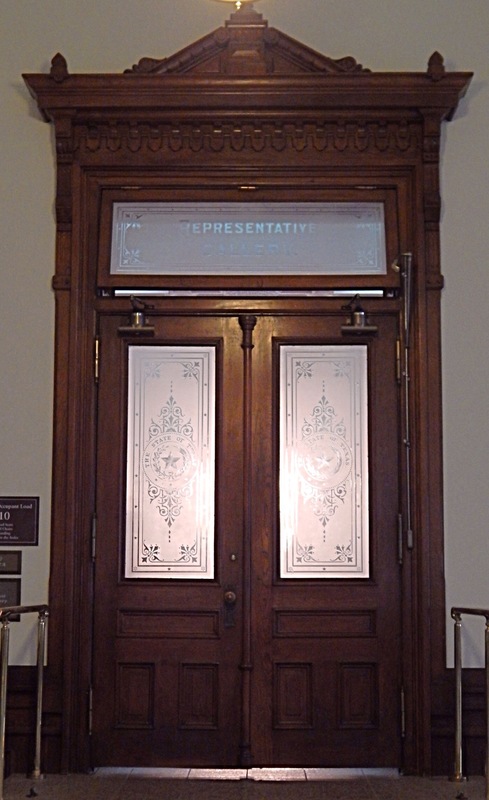 So a cool place to stop in, but take the displays with a grain of salt. I can personally say as an American that the Bell has not yet made me moved to tears or whatnot. 😉 We couldn’t resist goofy Rocky poses at the Independence Liberty Center. 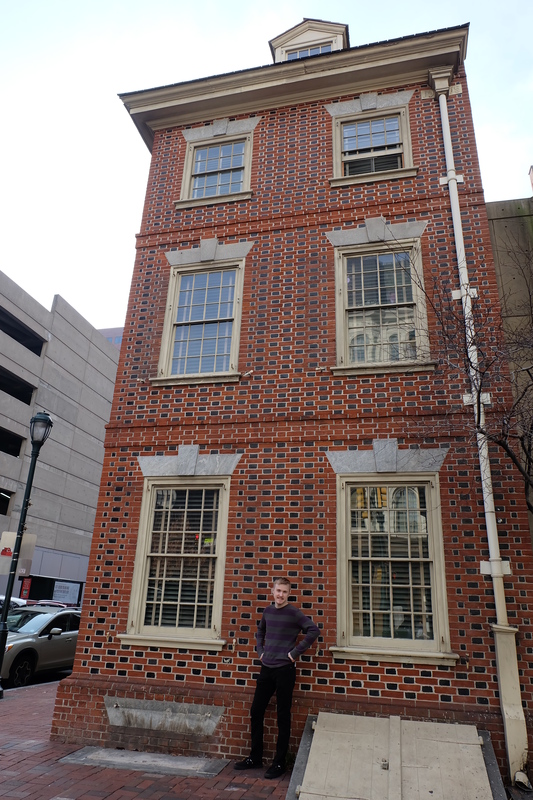 Walking down the street to get to Reading Market Terminal we accidentally stumbled upon the Declaration House where Thomas Jefferson wrote the Declaration of Independence. We stopped so Peter could model for a bit. For lunch we stopped in at Reading Terminal Market, which is an amazingly chaotic market with multiple food vendors, produce stalls, craft stands, and more! We took a good half an hour to wander around before deciding on where to eat. There were a ton of adorable bakeries and candy shops with lots of treats ready for the holidays. There was even a Christmas train set up for the kids… … or adults who really like trains. After much deliberation, I settled on Nanee’s Kitchen which had an amazing aroma wafting from the stand. The nice young man behind the counter was extremely helpful and when I asked which dishes on display were vegan (due to a lack of labels/names) he pointed out six or seven different options on main dishes and then said all the rice choices were animal-free too. Peter was hankering to try a Philly cheese steak, so he braved the line at Carmen’s to get their seitan version. A really neat thing was that instead of an order number you got a playing card. Since it was fairly crowded in the Market and great weather outside, we ate at the little park across the street. I had decided on a chickpea dish and okra in a tomato sauce over yellow rice. They included “salad” for free, which was just undressed shredded lettuce and carrots, but other than that the food was amaaazing. 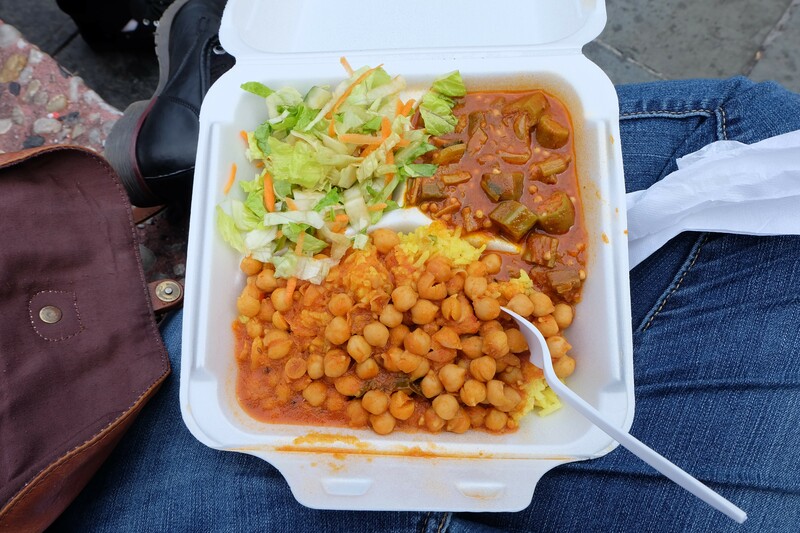 The chickpeas were soft and perfectly spiced over flavorful fluffy rice that soaked up all the sauce from the beans. The okra was great too (probably the most delicious way I’ve ever eaten the vegetable) with a slightly spicy tomato sauce and a great texture that reminded me of the way it’s served in gumbo. Nanee’s was a good choice from an almost overwhelming variety of food stalls. Peter was thrilled with his seitan cheese steak. He chose American cheese and got all the fixin’s of broccoli rabe, sweet pickled peppers, spinach, onions, and mushrooms. The Reading Terminal Market was a very good first food-impression of Philadelphia. We walked through City Hall into the inner courtyard that was decorated for Christmas and had several street performers. 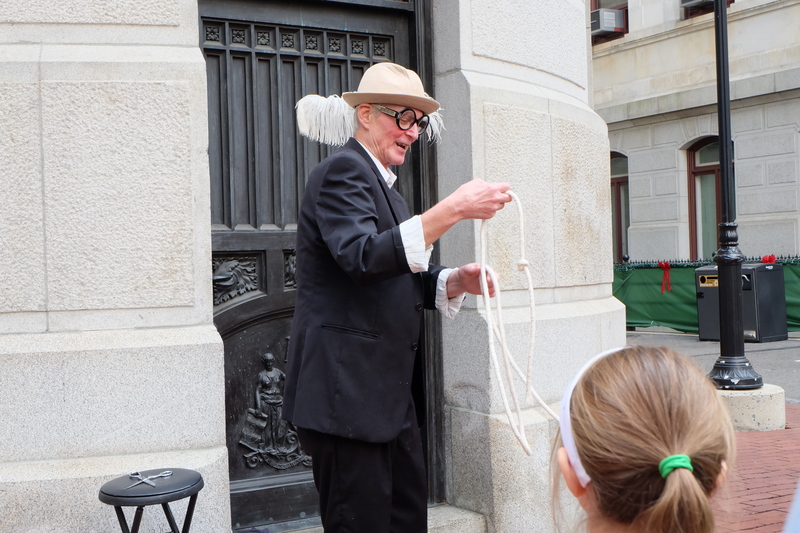 One performer was a very entertaining (and hilarious) magician who seemed to specialize with knotted ropes. 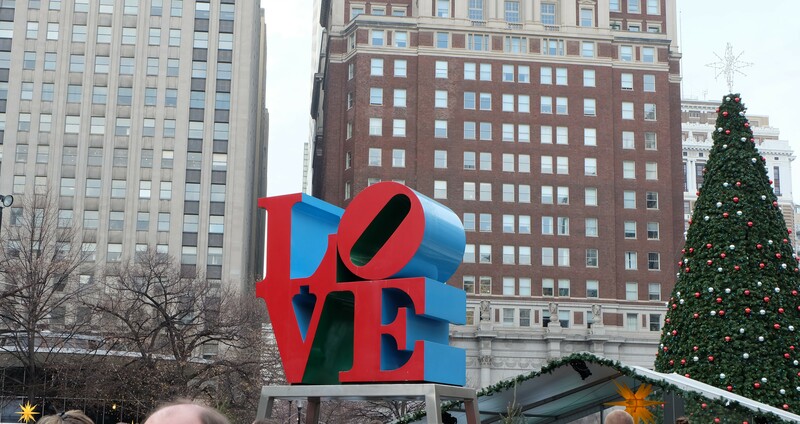 Afterwards, we visited JFK Plaza with the iconic LOVE sculpture and were pleasantly surprised to learn that a German Christmas market was taking place! There were a large amount of tiny stands with everything from handblown glass ornaments to little carved nesting dolls to knitted finger puppets. My pig obsessed self was not disappointed with the Christmas market which had a large amount of carved wooden pigs and ornaments scattered throughout the stalls. After getting our Christmas fix, we wandered down South Street, which was an equally sketchy and fascinating part of town with strange shops, restaurants, and bars. 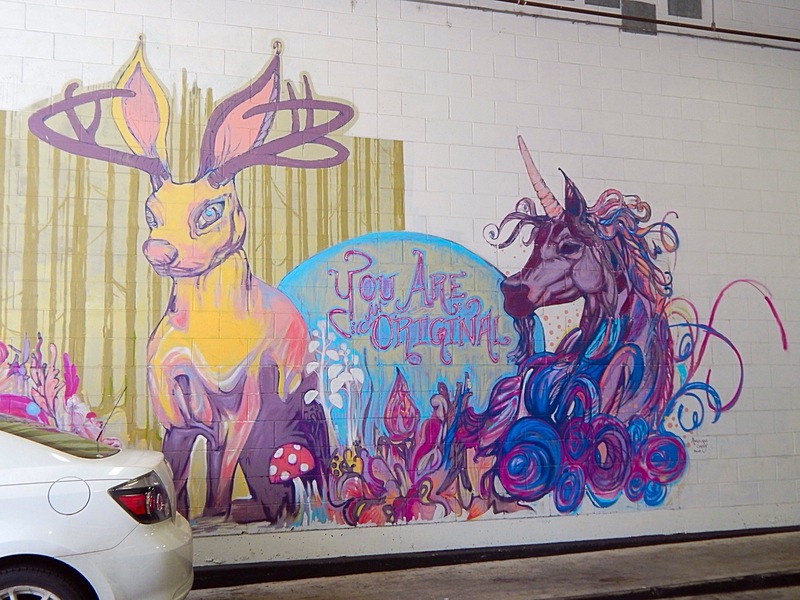 There was a decent amount of art spread throughout our walk too. 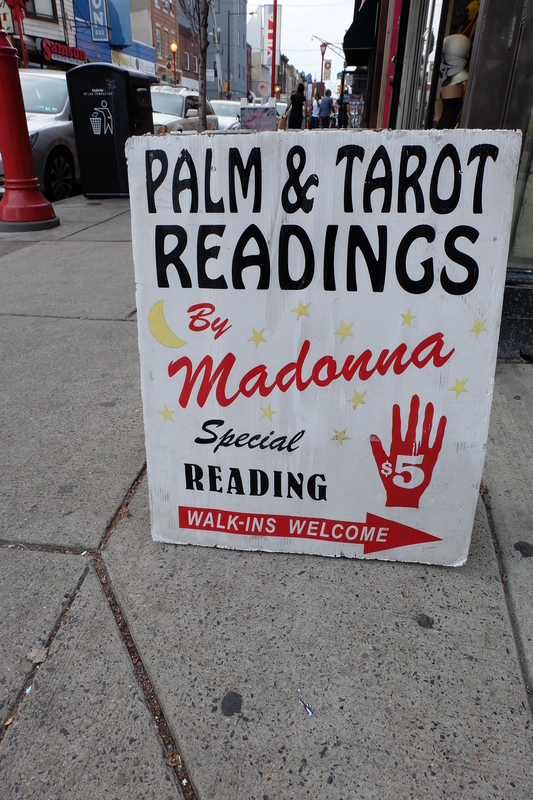 I’m sure you’re just as surprised as I am that the Queen of Pop is now reading palms in Philly. One of the weirdest shops we ducked into was The Wooden Shoe, an anarchist bookstore. The coolest part is that the store is entirely run by volunteers and holds various discussion events open to the community. The Wooden Shoe had a plethora of books, zines, and magazines with themes ranging from police brutality to feminism to (what a surprise) veganism. I also loved their kids section, which mostly focused on remaining true to yourself and reinforced the idea that nothing is wrong with being a black sheep. The main goal of our walk on South Street was to reach the Philadelphia’s Magic Gardens, a mosaic art project by Isaiah Zagar that spans several city blocks. The Gardens are a chaotic and beautiful piece of art that requires viewers to take a good amount of time to process all the tiny details hidden amongst everything. We spent about an hour wandering around and noticing all subtle parts of the pictures. Another bonus is that it only cost a total of $10 for us to get in with student IDs! This was definitely my favorite part of our Philly trip. I had a hard time picking my favorite pictures, so here’s a small gallery you can click through to see extras. For dinner we marched to China Town to eat at the totally vegan New Harmony Vegetarian Restaurant. This is a “Chinese” restaurant that is not authentic and highly American-ized, but honestly Peter and I enjoyed it because it was familiar to us due to growing up eating at Chinese buffets. We got the dinner deal which included soup, an appetizer, main dish, and dessert. It was a huuuge amount of food for the cost and we left with enough leftovers for another meal. Starting off we both got hot and sour soup, which was very tart with matchstick carrots and daikon with bits of tofu. Peter went for the spring roll and I got something I can’t remember the name of (even after looking at the menu again) but it tasted like a potato latke with cream sauce. The spring roll was just all-right but the “potato cakes” were great! Crunchy, salty, and creamy all at the same time. I went with an American-ized Chinese classic, sweet and sour chicken. It was just what I wanted. Chewy fried chicken in a thick syrupy sauce with chunks of pineapple and bell peppers. Peter got the orange beef, which was creepily similar to real meat and served with broccoli mixed in. We both forgot to specify which dessert we wanted, so our server brought out strawberry and pistachio ice cream, which we pretty much had no more room for at that point. Though I doubt it was made in-house, I really liked my pistachio ice cream because I’d never had it in my pre-vegan days and was always curious about what that would taste like. Overall, for those craving the American palate’s version of Chinese, New Harmony is a delicious and reasonably priced choice. 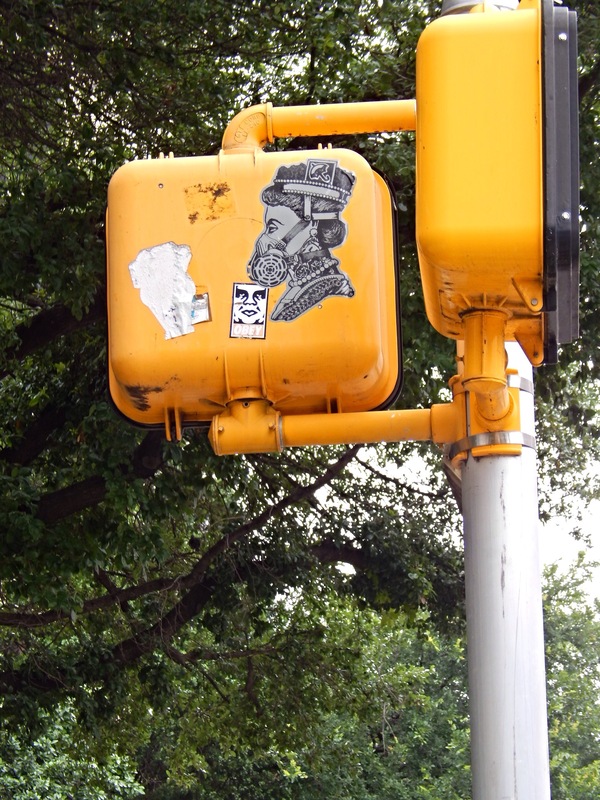 Stay tuned for Philadelphia part II! 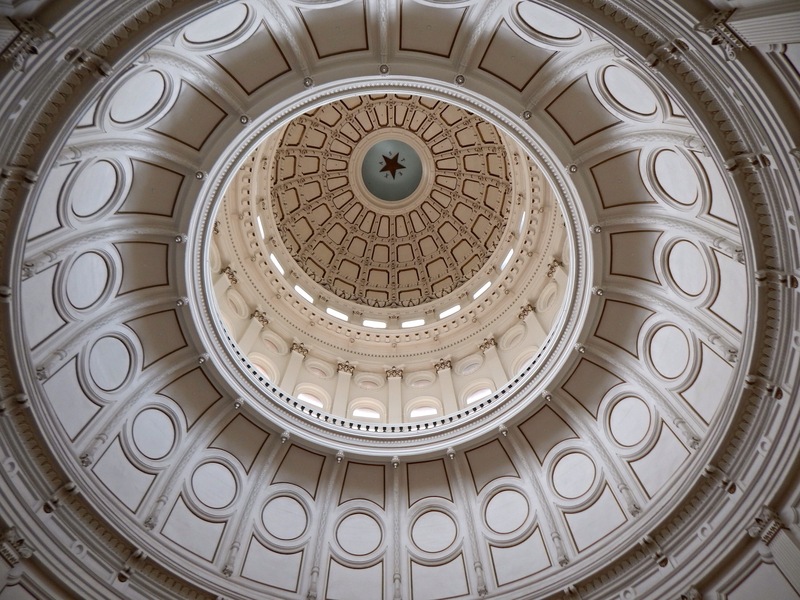 This post is definitely going to be the longest thing I’ll write about our honeymoon, because we stayed nearly 4 days in Austin, an amazingly vegan-friendly city. If you’re comfortable walking pretty much everywhere, we recommend staying at the Super 8 near the capital/university area. 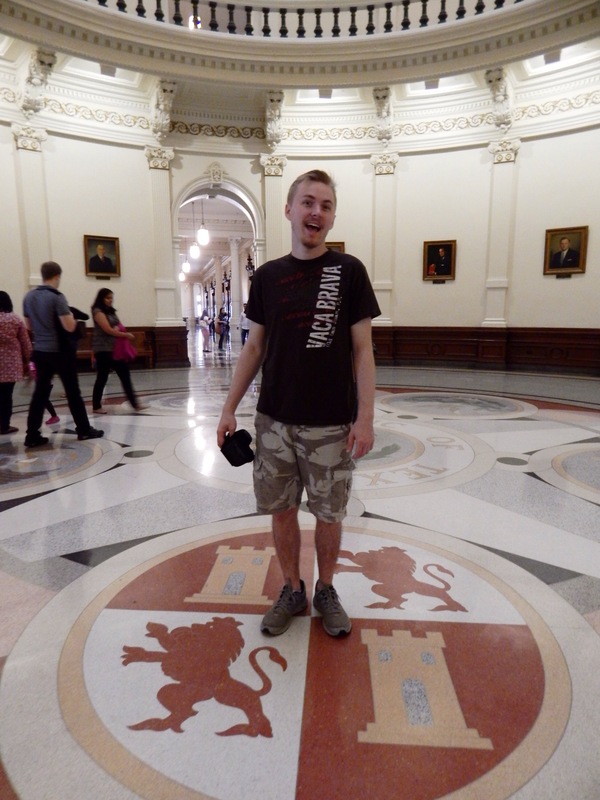 We stayed there and it was a five minute walk to downtown Austin. Day 1: We arrived by train in the early afternoon and immediately set off looking for the Shhmaltz food truck, famous for their vegan reuben. The truck is in a nice little area tucked behind a bookstore. We somehow managed to get lost, but when we called the lovely owners (twice actually) they managed to give us directions that led us there. So, even if you’re using Google Maps, remember to check behind the bookstore! The area was nice and green with a canopy to shade us from the sun. Plus adorable planters with succulents decorated the tables. I, of course, got the vegan ‘Harvey P’ reuben and on the side a pickle sampler. The sampler included pickled cucumber, jicama, carrots, and watermelon radishes. 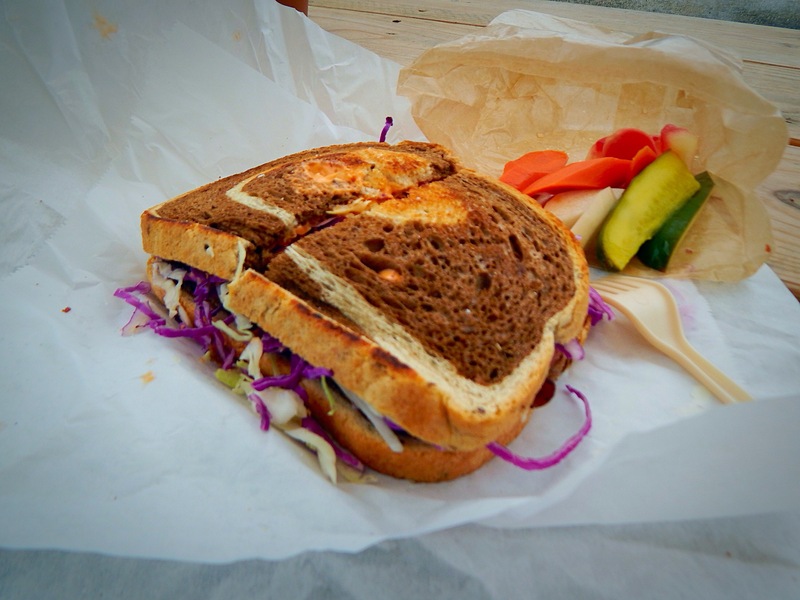 The sandwich lived up to the hype, and the pickles were the perfect accompaniment. The seitan (house-made, I might add) was full of flavor with an eerily similar to meat texture, topped with an equally delicious sauce and smashed between toasted marbled rye. Peter ate their ‘Gertrude Stein’ goat cheese sandwich, that he described as “creamy and yummy”. 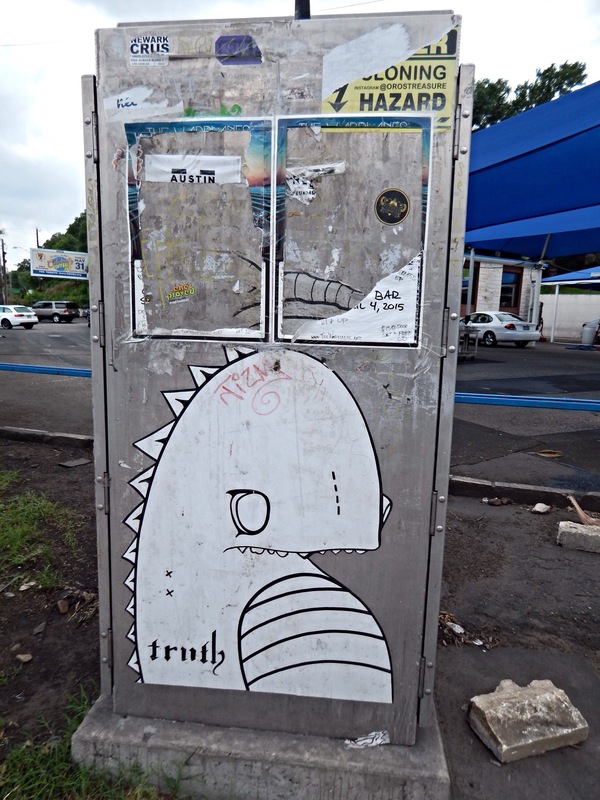 The city was chock-full of interesting street art. 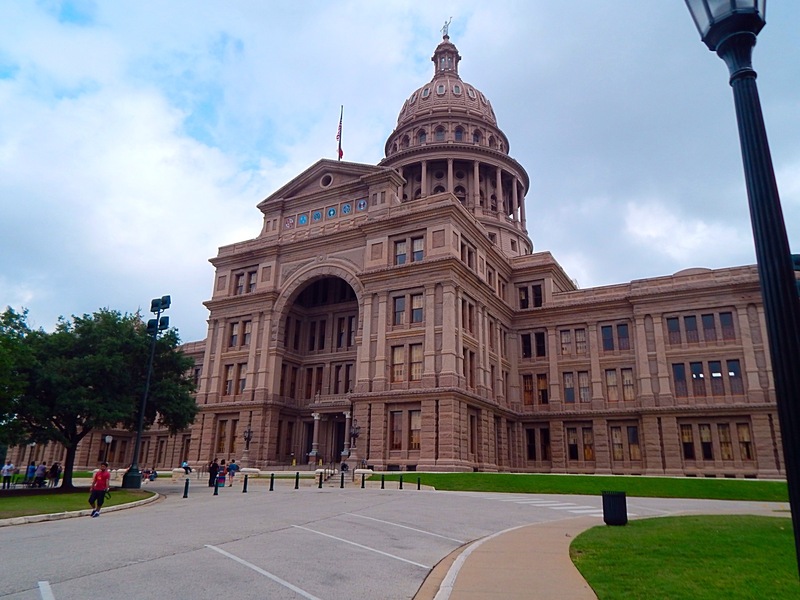 Although we don’t have any photos from it, our afternoon was spent wandering through downtown before heading to the University of Texas campus to visit the Blanton Art Museum and the Texas Memorial Museum. The Blanton was awesome with several pieces of modern art and an exhibit on civil rights. My personal favorite piece was a life-size Aunt Jemima packing heat. 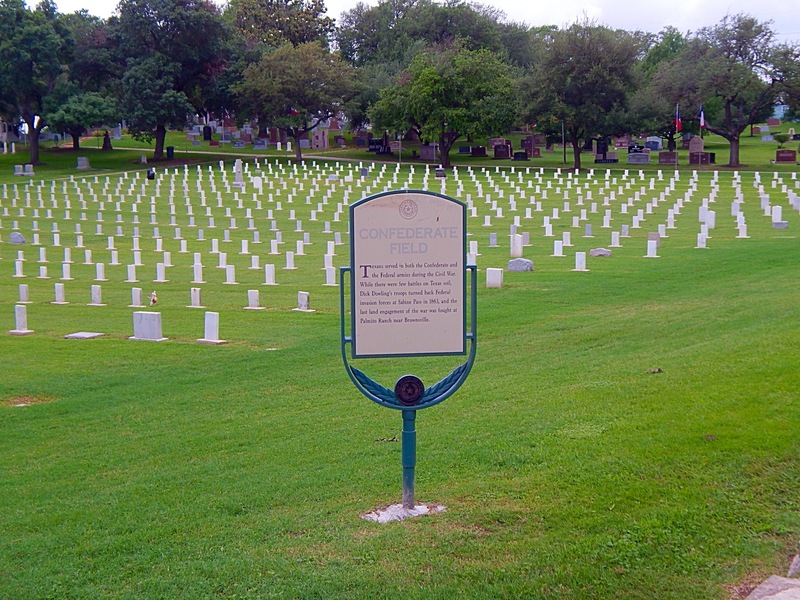 The Texas Memorial was small, but interesting, and definitely worth the small entry fee of $2 each for students ($4 for anyone else 13+). It had a decent collection of geodes, minerals, dinosaur bones, and examples of local wildlife. Before we knew it, we’d actually been looking around there for over an hour! All of that walking built up an appetite, so we visited a food truck I’d been hearing about (and wanting to visit) for years: Arlo’s. We got there right before a storm was about to break and the guys in the truck were happy to package our meal for to-go. Once we got our food, the heavens opened and our tiny umbrella couldn’t shield both us and the burgers. So we sacrificed our own comfort to save the food, and jogged to our nearby hotel. 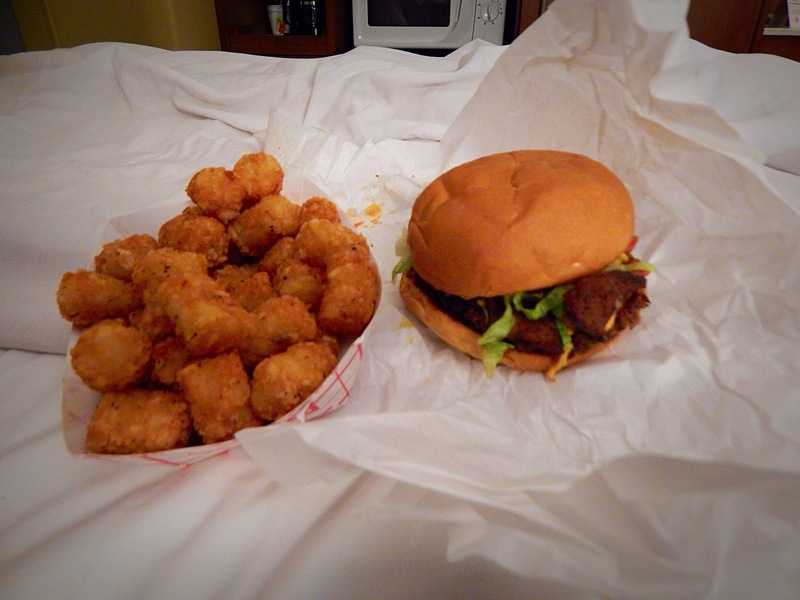 Once dried off in the hotel (sorry for the shoddy lighting) we dug into our bacon cheese burgers and order of tater tots. Now I know you can’t tell from the picture, but this is the most magnificent burger I have ever eaten. Probably my favorite meal of our entire honeymoon. The burger patty and bacon are all house-made seitan, and I’m fairly sure they used Daiya cheese, along with lettuce, tomatoes, and mustard. Oh man. We ended up eating there twice more during the trip, despite us wanting to try new things every meal. 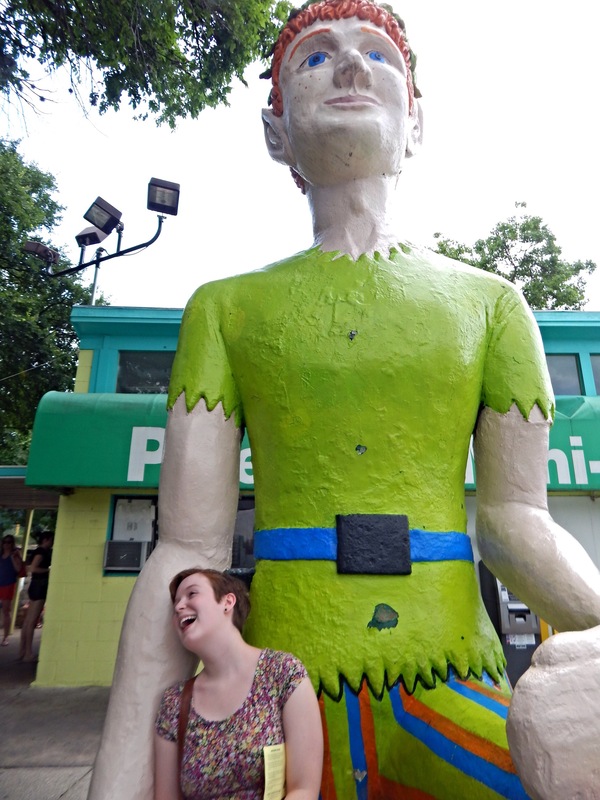 If I lived in Austin, I’m pretty sure the Arlo’s staff would soon know Peter and I by name. 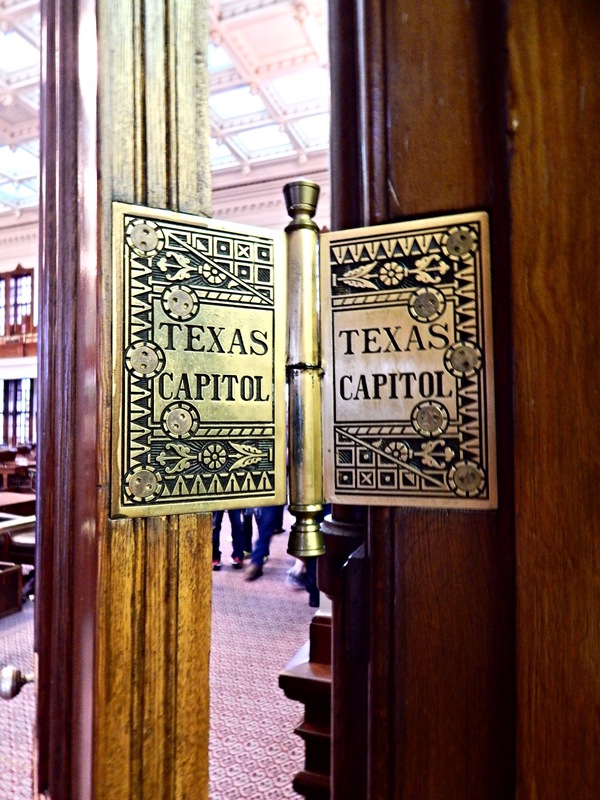 Day 2: We were up bright and early to visit the Texas Capital Building and go on a tour. 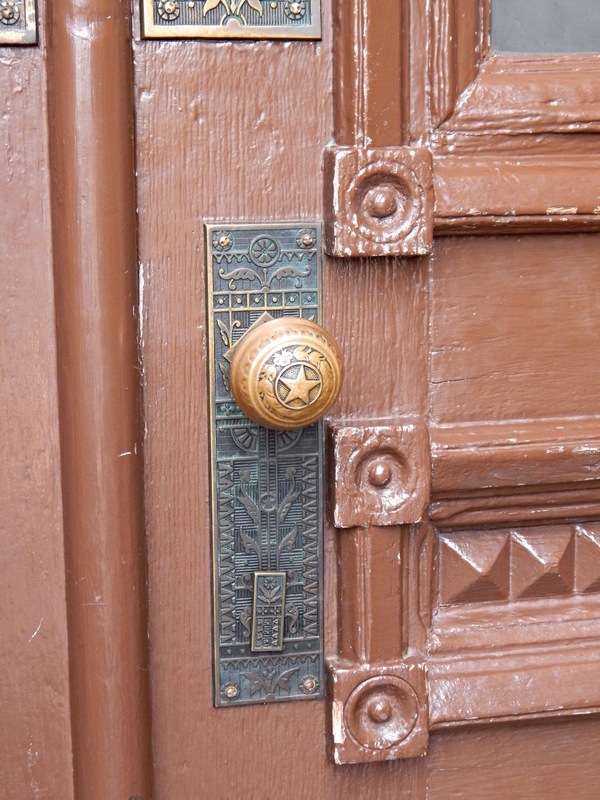 The building was amazingly decorative, from the doorknobs to the hinges. 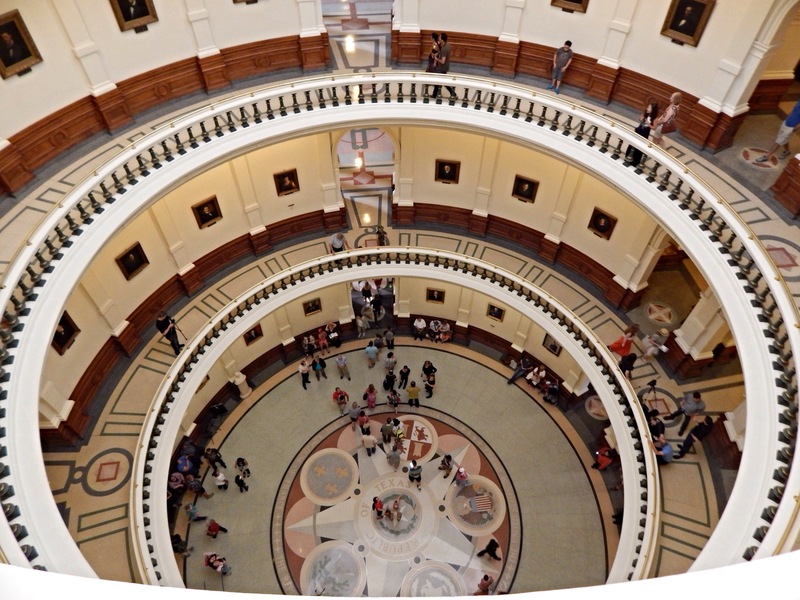 The main focal point (and the most crowded place) was the center of the building, which at the very tip-top featured a huge star that was actually 8 feet across, but looked much smaller from the ground level. Our tour guide was nice and informative, and seemed genuinely happy to answer questions. 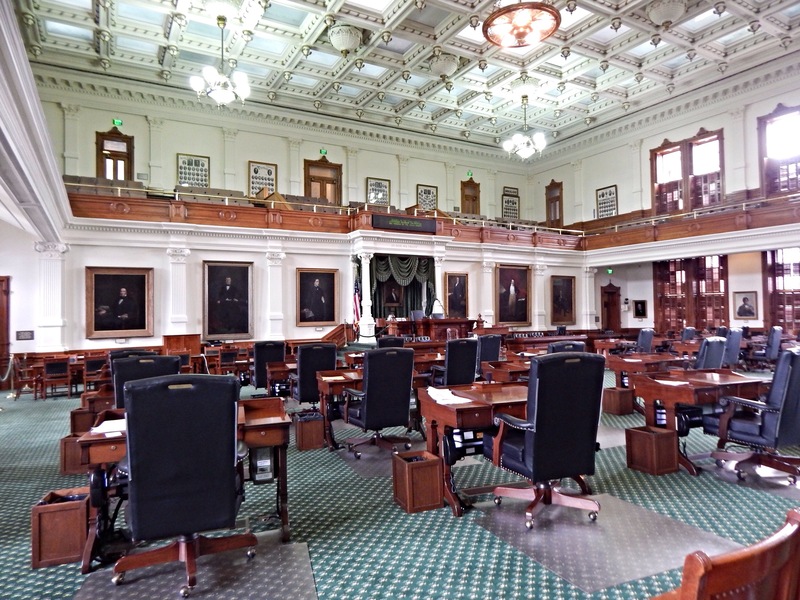 We went through the Texas House of Representatives room, and were told about various things happening there and the history behind some of the portraits on the walls. 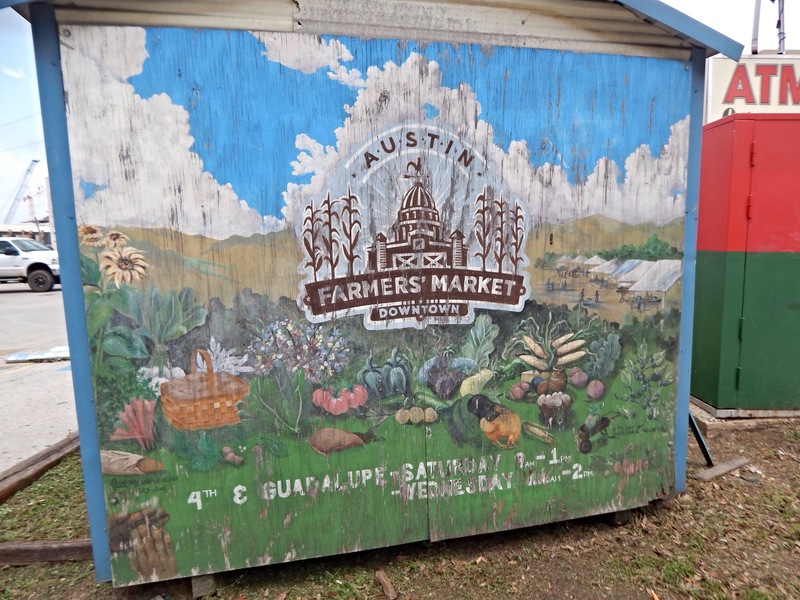 For lunch we went to the Austin Farmer’s Market. 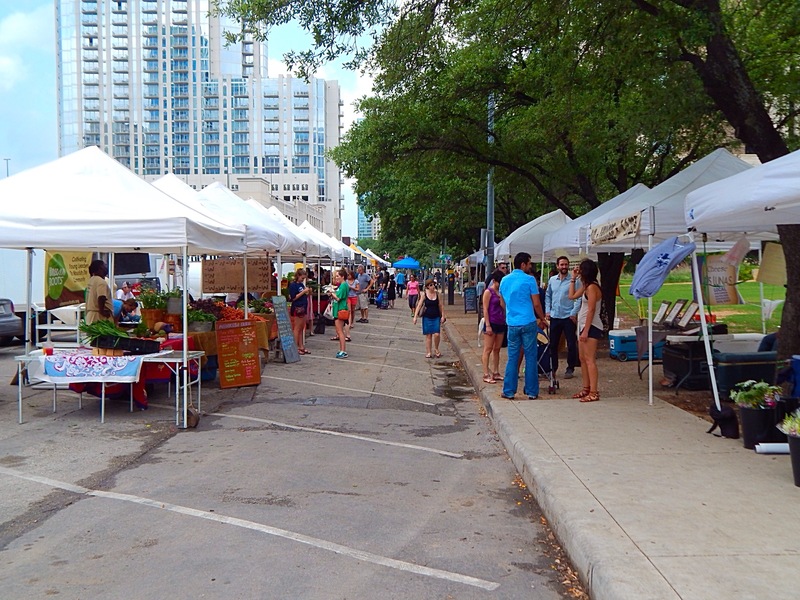 There were so many vendors with beautiful local produce and products. It made me quite sad that I didn’t have a kitchen to cook all the wonderful looking fruits and vegetables in. We got some tamales at The Gardner’s Feast tent. I chose the mushroom type and Peter got feta and spring veggies. To drink we had our first encounter with kombucha at the Buddha’s Brew tent. They had taps on display so you could sample the wares before investing in a bottle. We both ended up liking the blueberry flavor best. 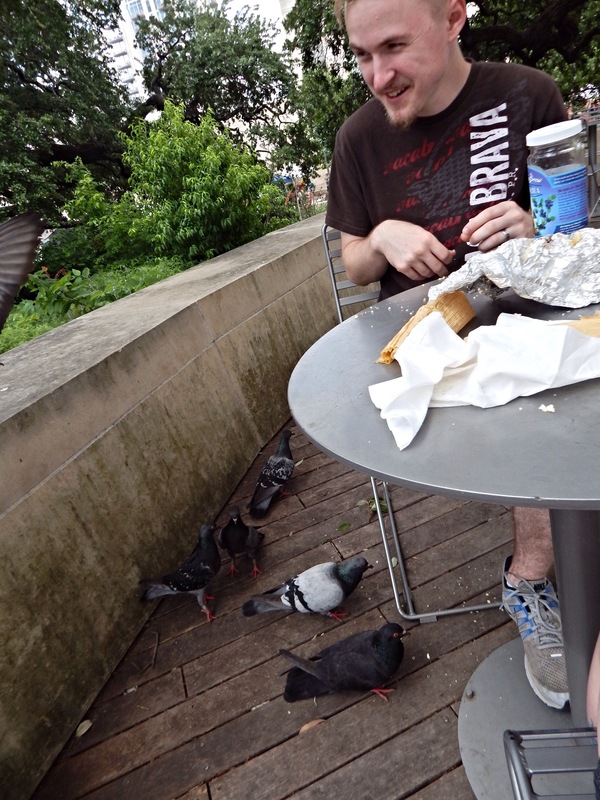 Peter being King of the Pigeons after dropping tamale crumbs. We couldn’t resist dessert from the Happy Vegan Baker. 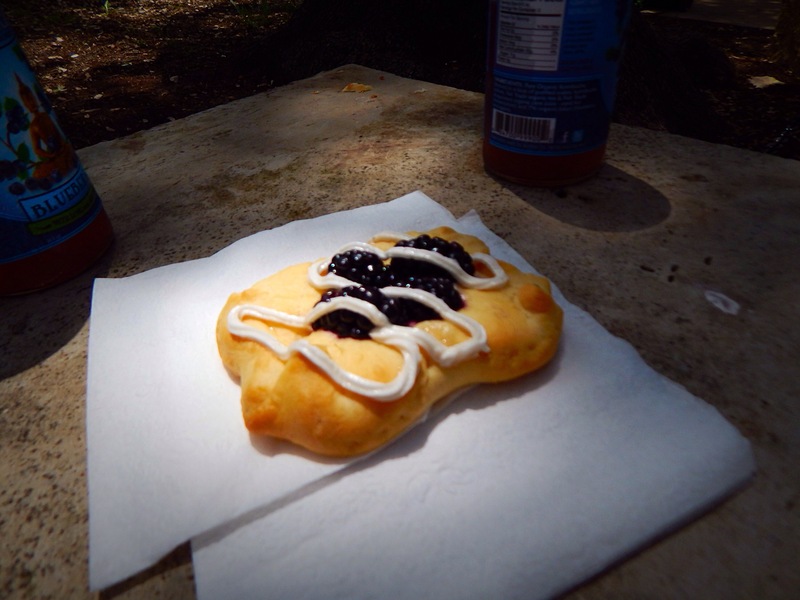 Peter chose a vanilla cupcake and I got a blackberry pastry. Both were delicious and we left the Farmer’s Market full and happy! We couldn’t resist a good photo op. 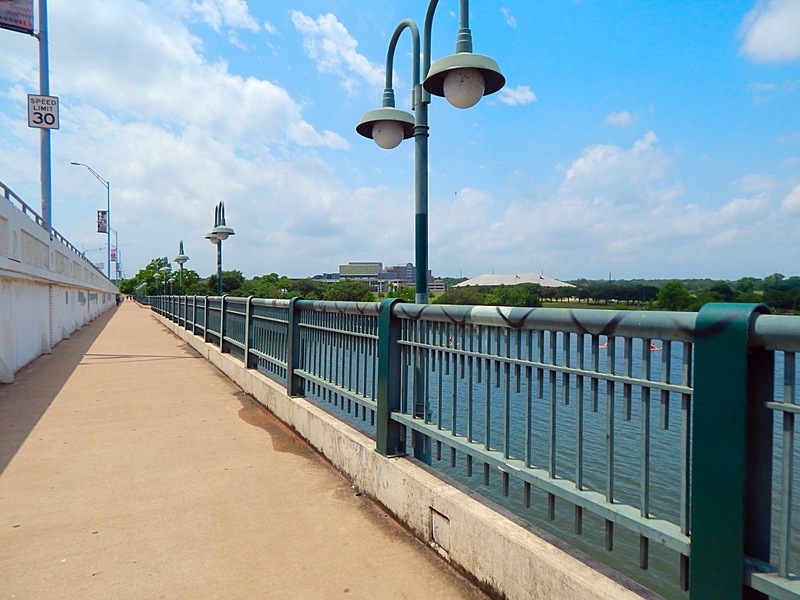 The First Street Bridge was a really pleasant walk over the Colorado River. It was a pretty view and felt far away from the actual traffic. Our main destination across the bridge was Peter Pan Mini Golf. A kinda creepy but a lot of fun mini golf course. 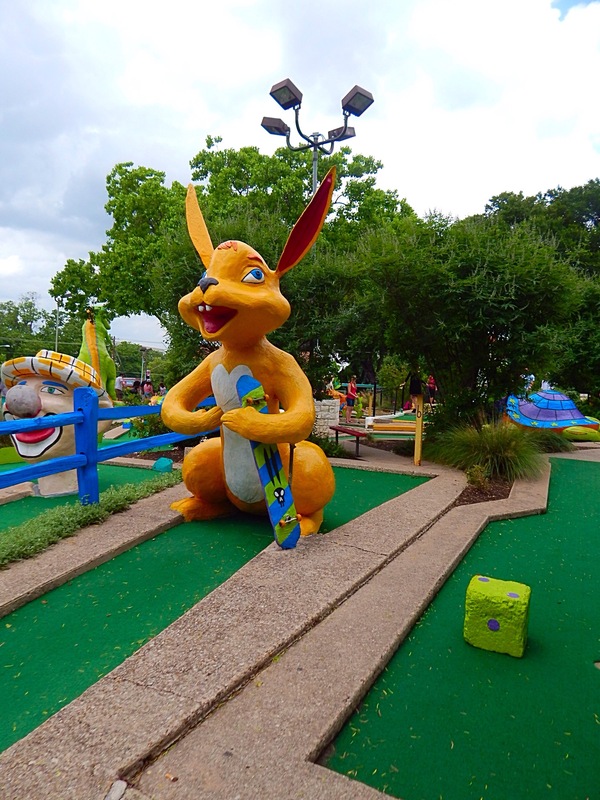 I don’t know who sat down and thought up the ideas for each hole’s theme. 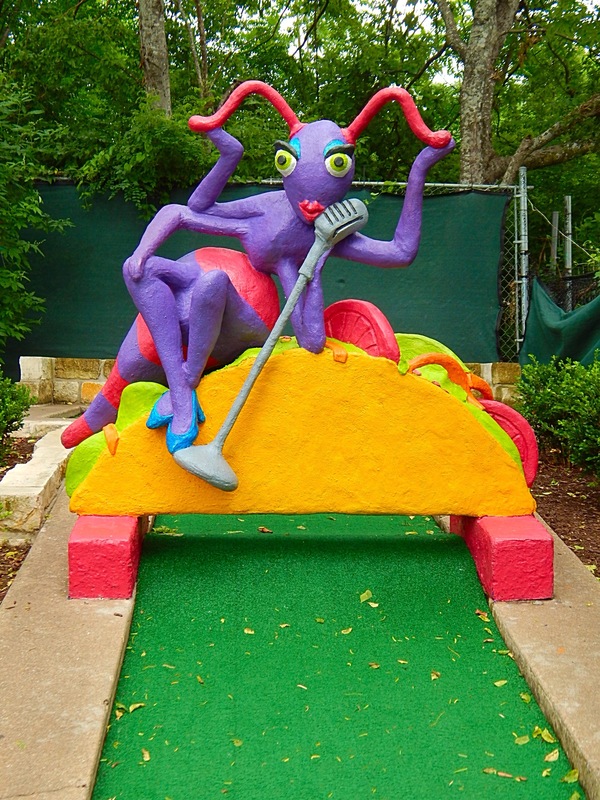 Seriously, an ant singing on a taco? 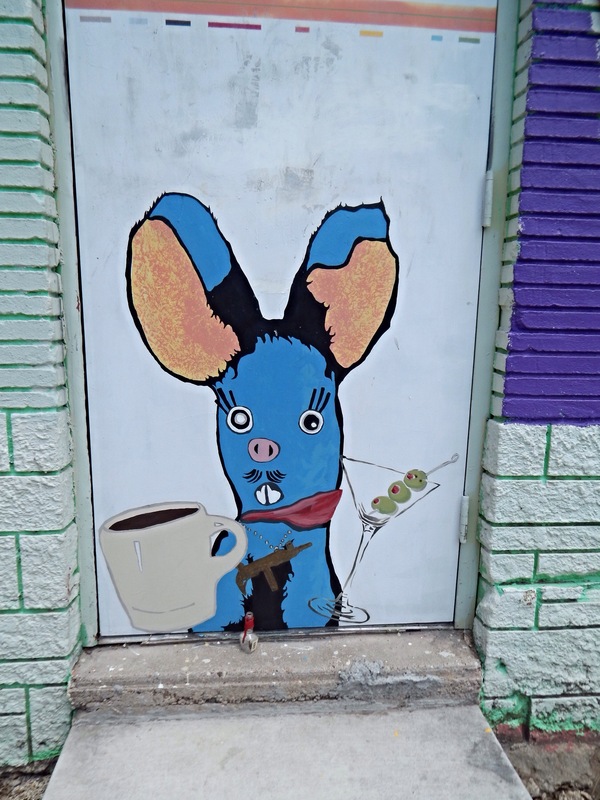 Or an obviously high bunny rabbit with a skateboard? The wackiness of the sculptures made it even more fun. 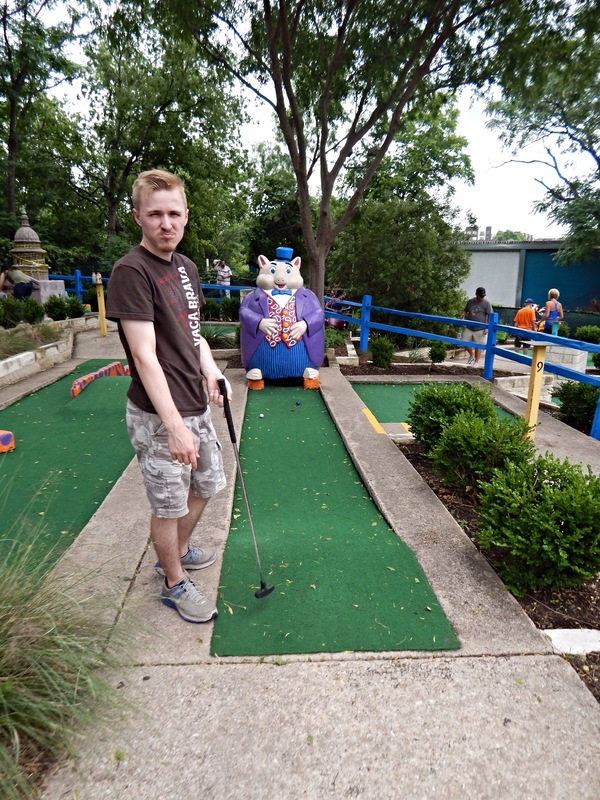 Neither of us are actually any good at mini golf. Missing holes took up the rest of our afternoon, so we decided to get dinner on that side of the river. 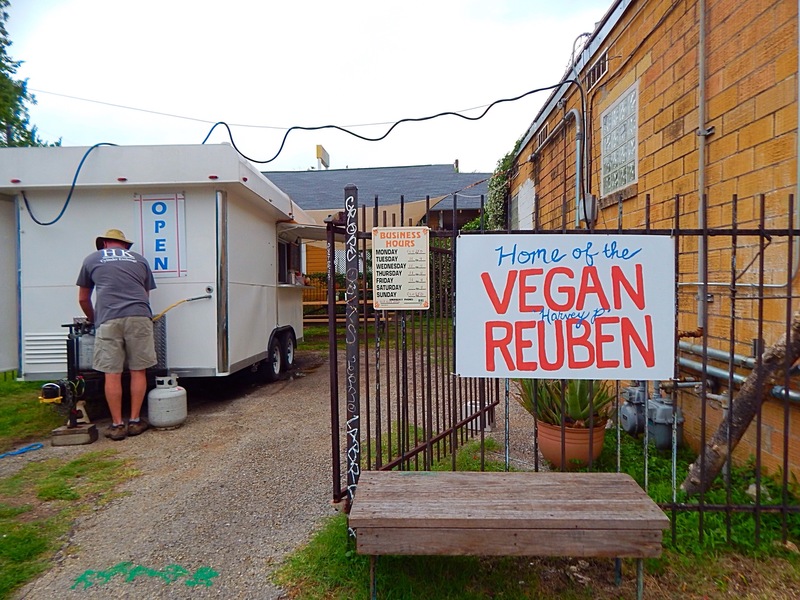 Thankfully, it’s hard to go someplace in Austin and not be within two blocks of vegan food. Unity Vegan Kitchen was just a short walk away and offered some very, very good food. Peter partook in the lasagna, which was a big portion size and filled up with thick tomato sauce, something similar to ground beef, and cashew cheese. I chose their weekly special, which was a chick’n and cheese chimichanga. Peter is happy with anything pasta, so he gave his meal a thumbs up. 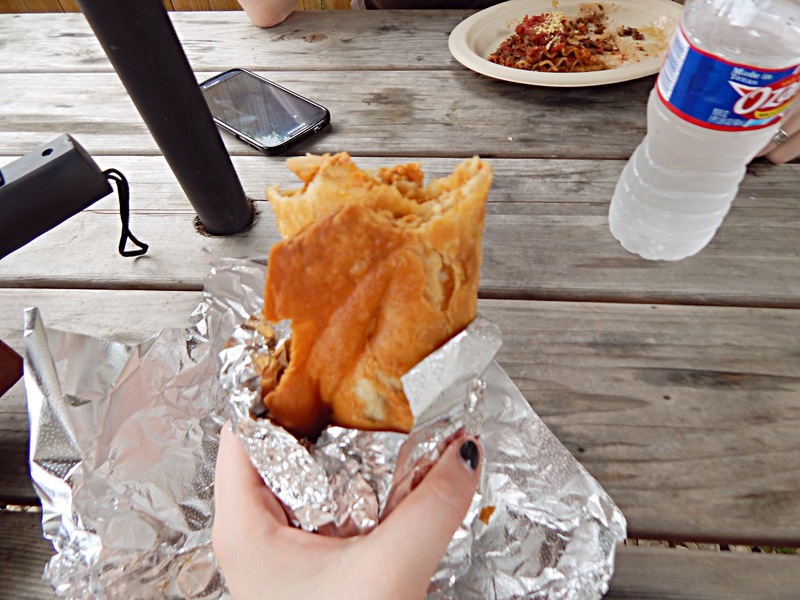 Mine was amazing and full of gooey cheese, spiced chick’n (pretty sure it was Beyond Meat), and all wrapped up in a crispy fried tortilla. It was also served with two cups of salsa on the side, one red and one green. 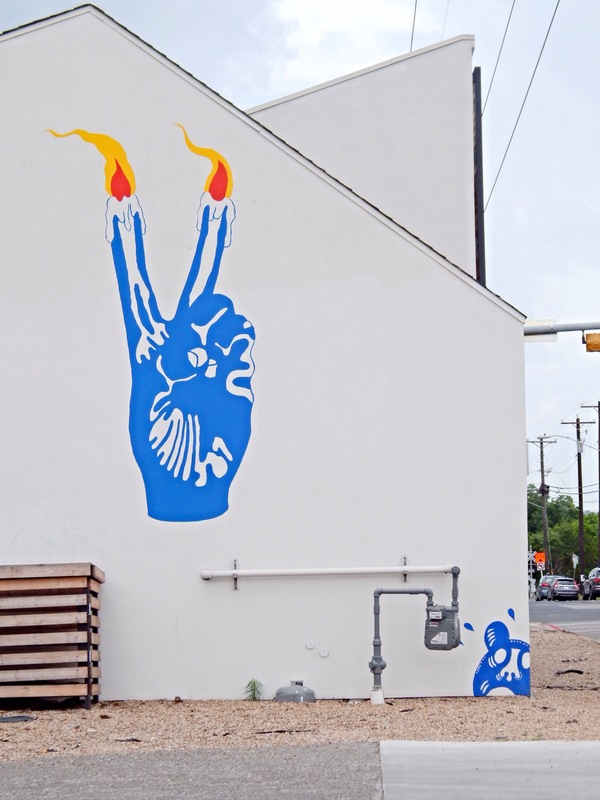 If you’re in the neighborhood, check this place out. Their food rocks. 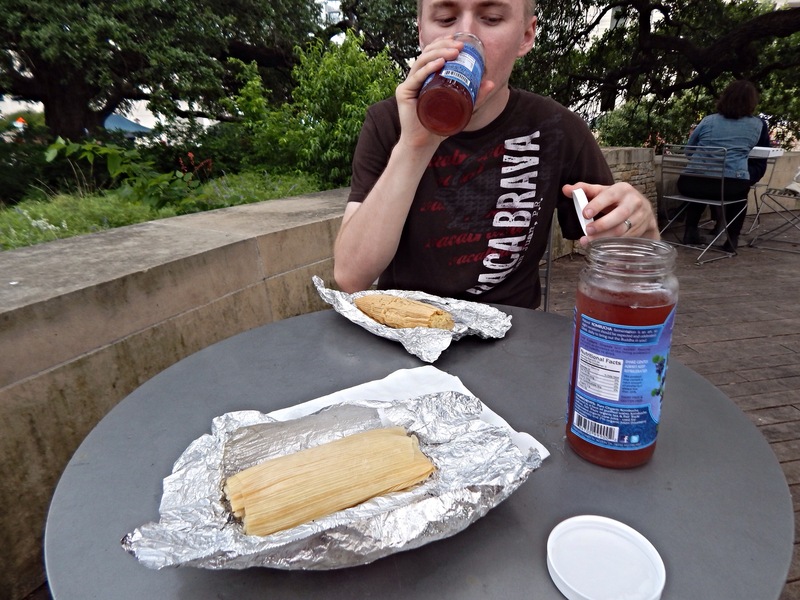 Day 3: Texas has a reputation for having great Mexican food, so we wanted to try out the Tamale House East, which had stellar reviews online. The large line told us that it must be worth waiting for. 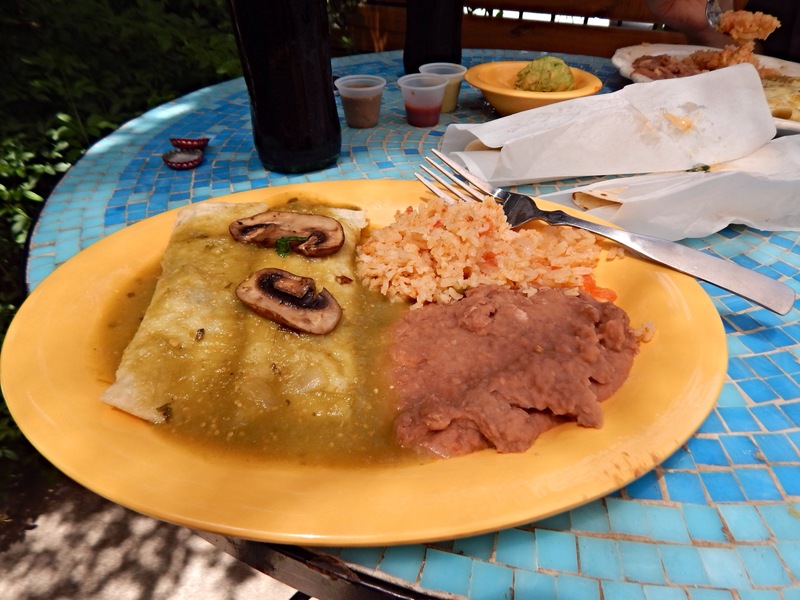 I happily ordered the vegan mushroom enchiladas and Peter asked for the cheese enchiladas. 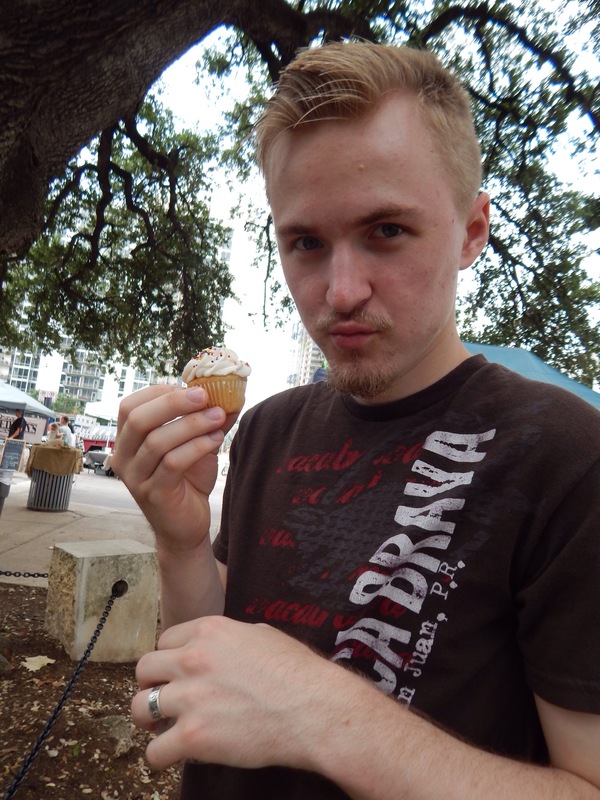 I’m sad to say that this was our one bad food experience in Austin. The waitress brought out our food and mine had cheese. I told her I’d ordered the vegan enchiladas and she seemed bewildered and said that was them. “Is this vegan cheese?” I asked doubtfully and then she said “No.” After a minute, the manager came out and said he could fix this and whisked the plate away. About 5 minutes later cheese-free enchiladas were at my table, though all of the staff had acted like I was being unreasonable. 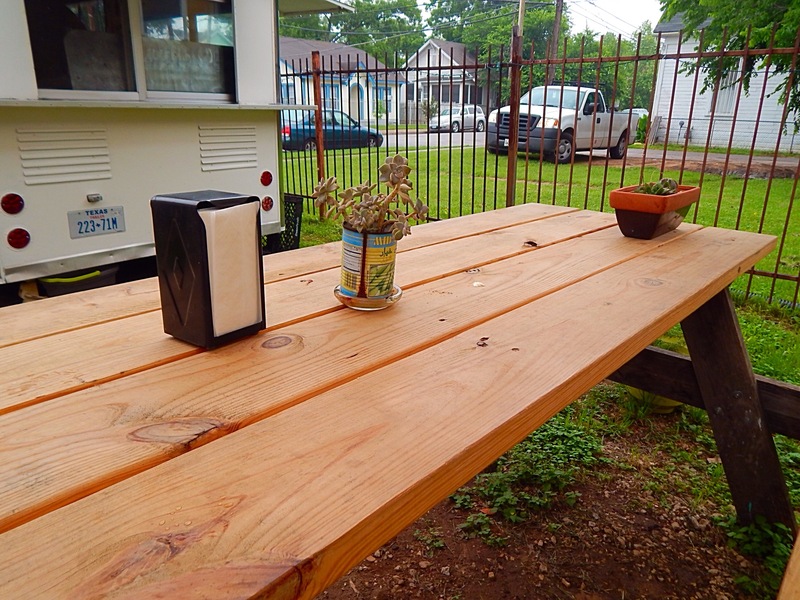 The food was just mediocre, like something I could get at any run of the mill Mexican joint. A soggy corn tortilla stuffed with sauteed mushrooms (without any real flavor) and topped with green salsa. The sides were fine, but lukewarm when brought out. Needless to say, I wouldn’t recommend going there if you don’t want a plate covered in cheese. 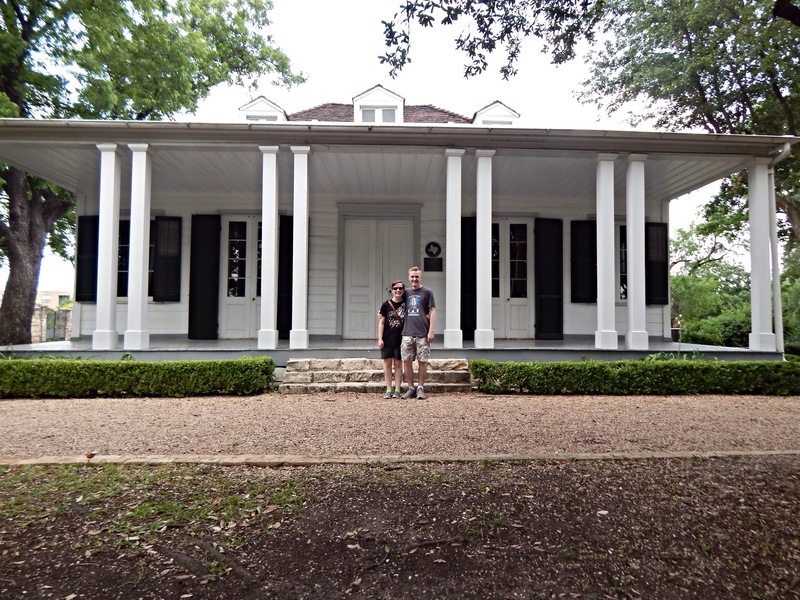 We visited the French Legation Museum on a whim, and it turned out to be one of our favorite parts of Austin. 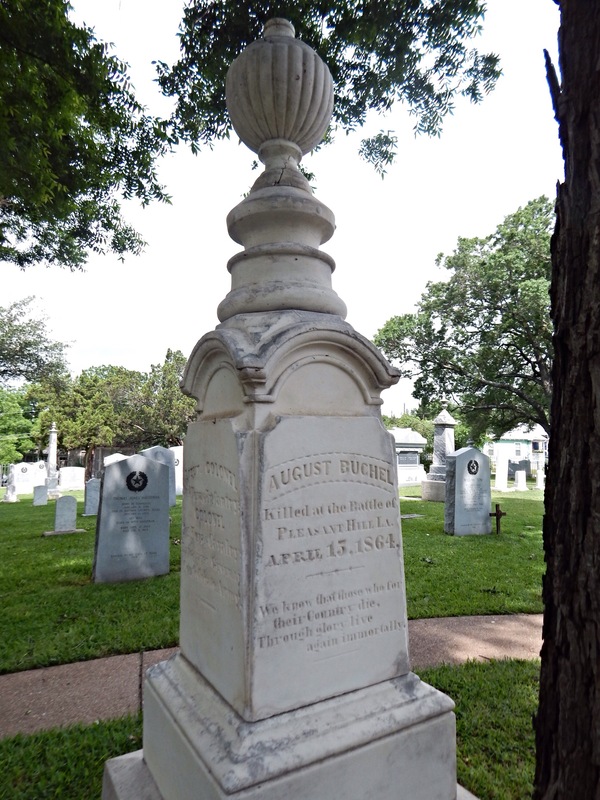 It featured Austin’s oldest home and our tour guide told us about former residents. The entire thing was furnished with period pieces and fascinating to view. If you don’t want to pay for the tour (even though it was only $5!) the grounds are free to visit during the museum’s open hours. 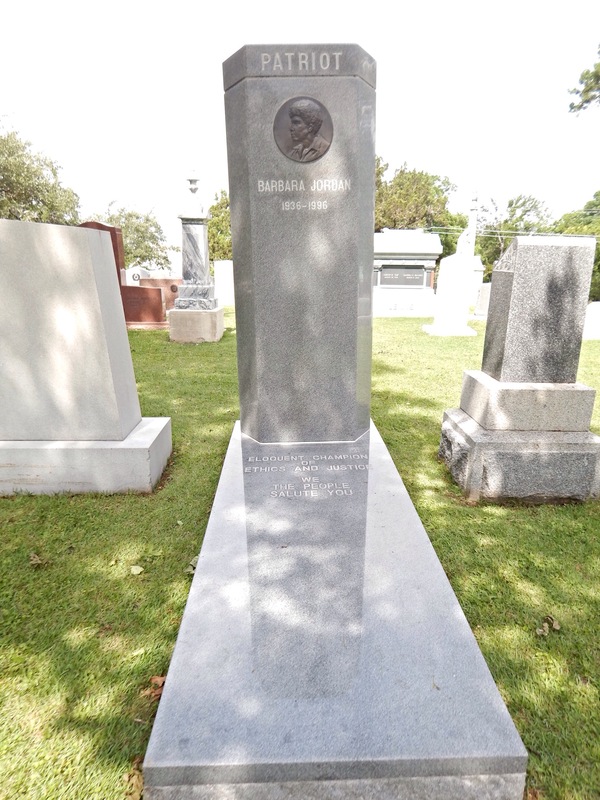 Afterwards we strolled through the Texas State Cemetery. 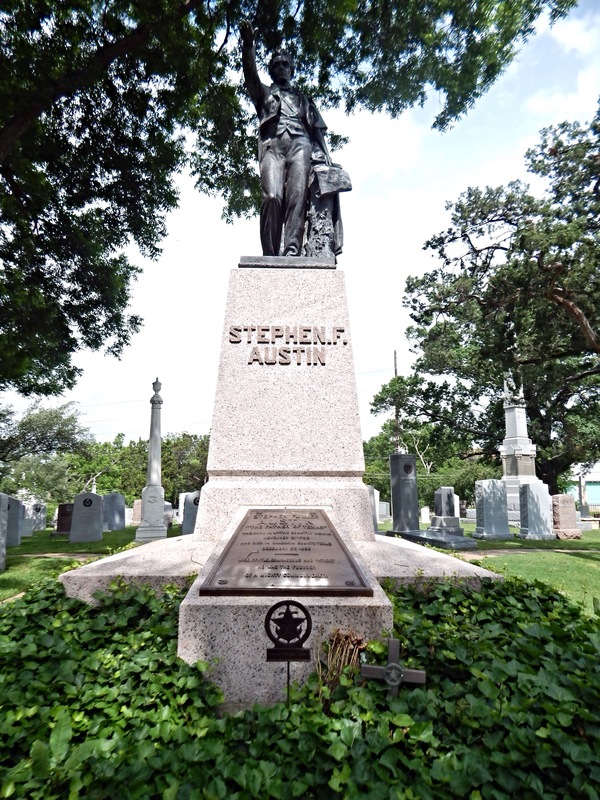 It was well kept and featured some well known people (including Austin’s namesake). 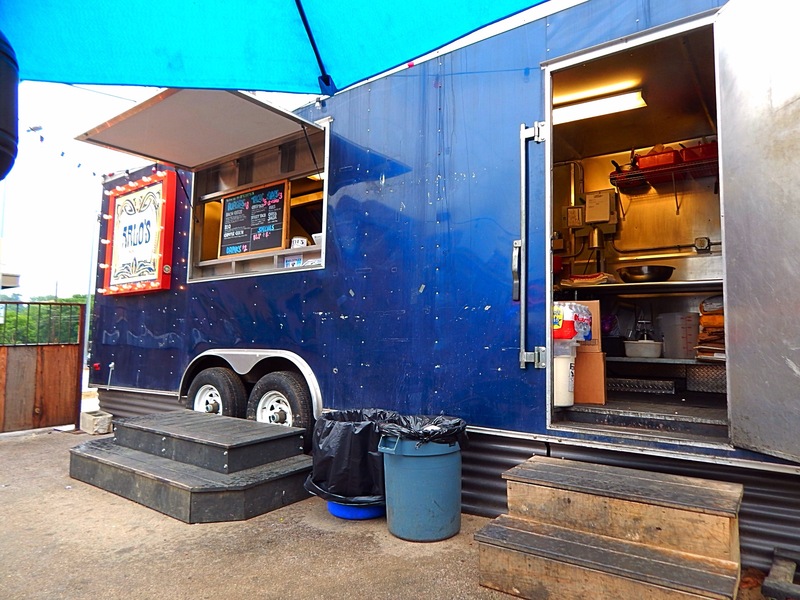 Since our last restaurant visit didn’t work out, we decided to stick with food trucks again. 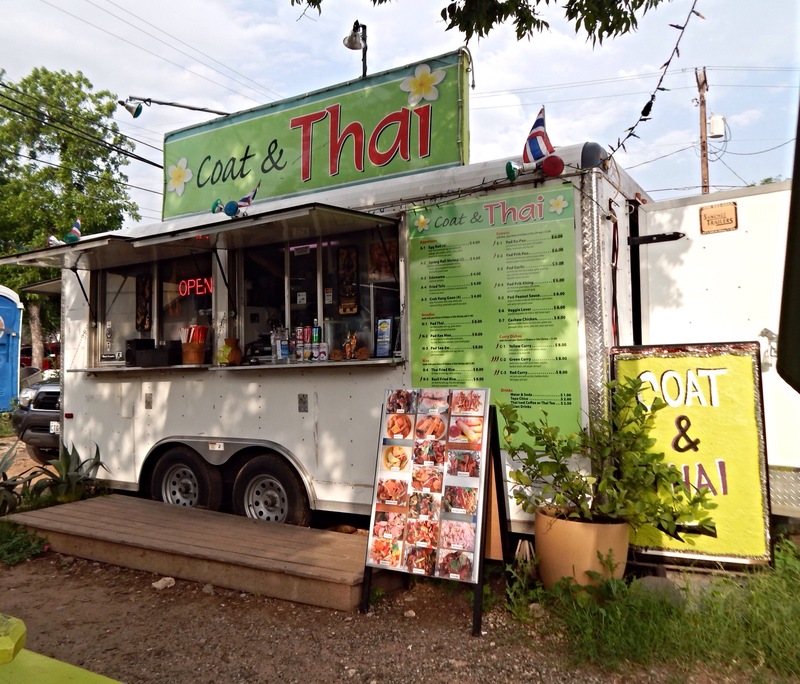 There was a food truck park just a five minute walk from the hotel and there we settled on Coat and Thai for dinner. Peter got the pad thai and I ordered the green curry (be sure to specify you want it vegan!). We got it packaged to-go so we could eat while we waited on the bats. 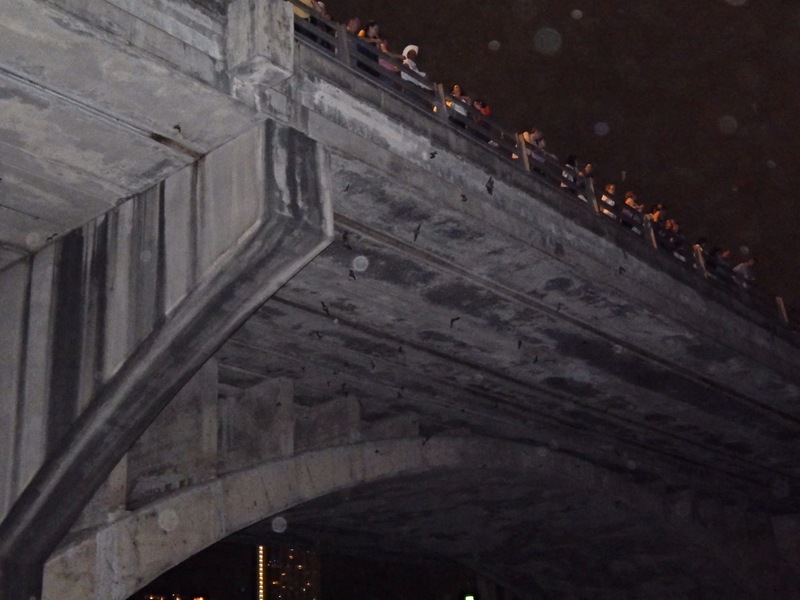 Under Congress Avenue Bridge is a horde of thousands of bats that fly out every night and people go out to watch them. The area where we sat was actually really nice, even more so when it cooled down after the sun set. We happily sat there and ate our Thai food (which was delicious and very filling!) while we waited. 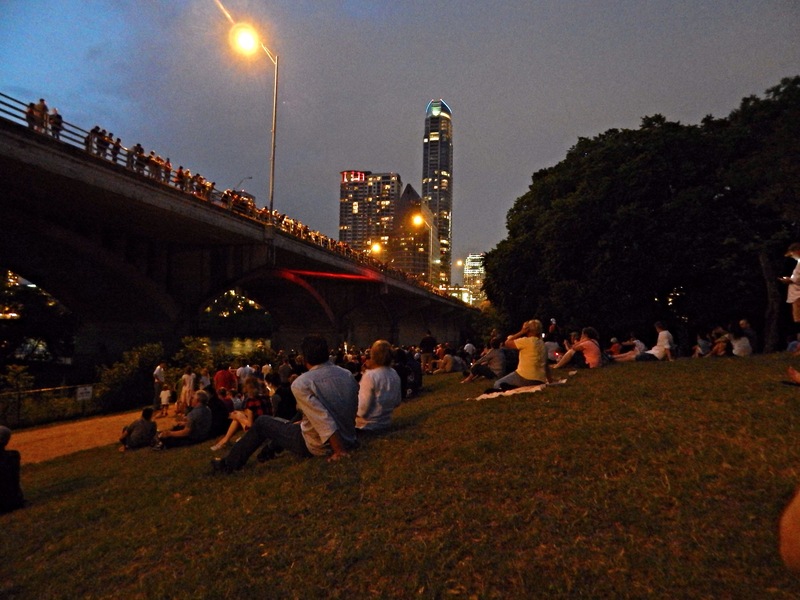 Eventually a steady stream of bats flew out and it was an amazing sight. You could hear them squeaking and see them fly out into the nearby trees. 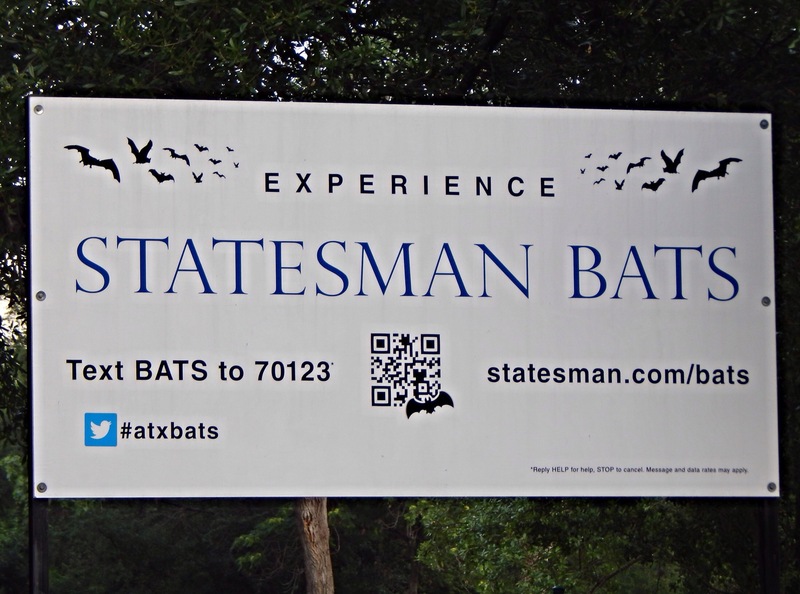 We stayed about two hours, just fascinated by the seemingly unending amount of bats. 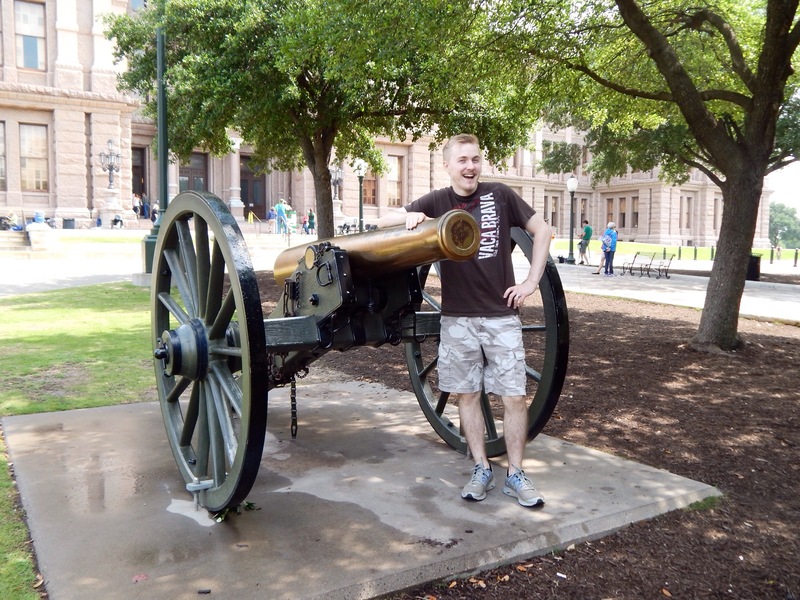 Our train out of Austin was later in the day, so we had time for lunch and an activity or two. We went back to the food truck park, but sadly Coat and Thai was closed. Luckily though, Way South Philly was open! Peter got the Marciano and asked for no steak, so basically it was a pizza sub (which he was ecstatic about). I got the Adrian, which had squash, zucchini, mushrooms, bell pepper, and onions. I gotta be honest, at first I was sad at the thought of just a veggie sandwich. I expected something that would probably be a little plain and not filling, but boy was I wrong. The veggies were all perfectly cooked and well seasoned. The roll it was served on was equal parts crusty and soft, and then everything was perfected with a little drizzle of hot sauce on top. 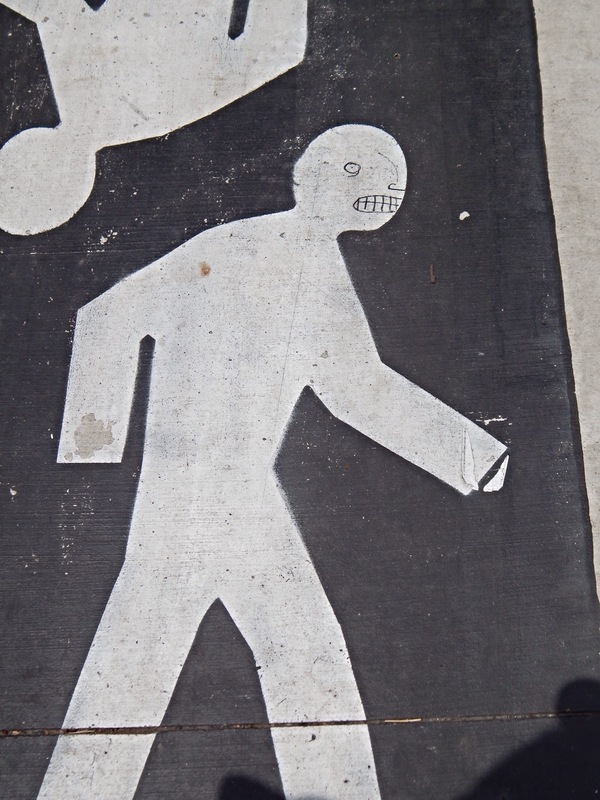 Good job, Way South Philly. You taught a jaded old vegan that even a meat and cheese place can make a darn good veggie sandwich. After lunch we walked around 6th Street, which had a huge collection of restaurants, art galleries, clothing stores, and other wacky findings. 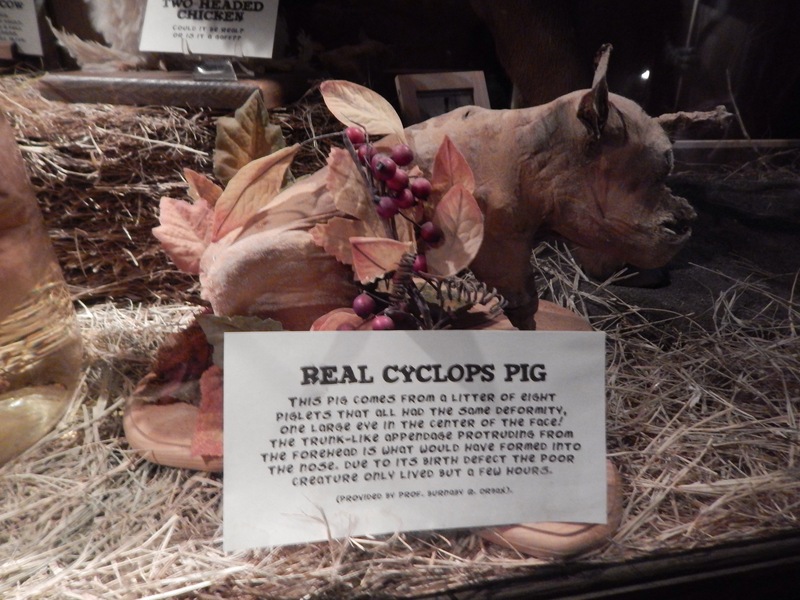 One of the best things there was the Museum of the Weird, which was tucked into the back of a gift shop. When you first enter the tour guide does a small (yet impressive) show featuring sword swallowing and other classic stunts. Then you’re free to explore the museum’s array of items, ranging from deformed taxidermy animals (see below) to the fiji mermaid and big foot tracks. Although the museum wasn’t huge, we had a great time there. A lot of the displayed items’ authenticity are questionable, but that just adds to the fun. 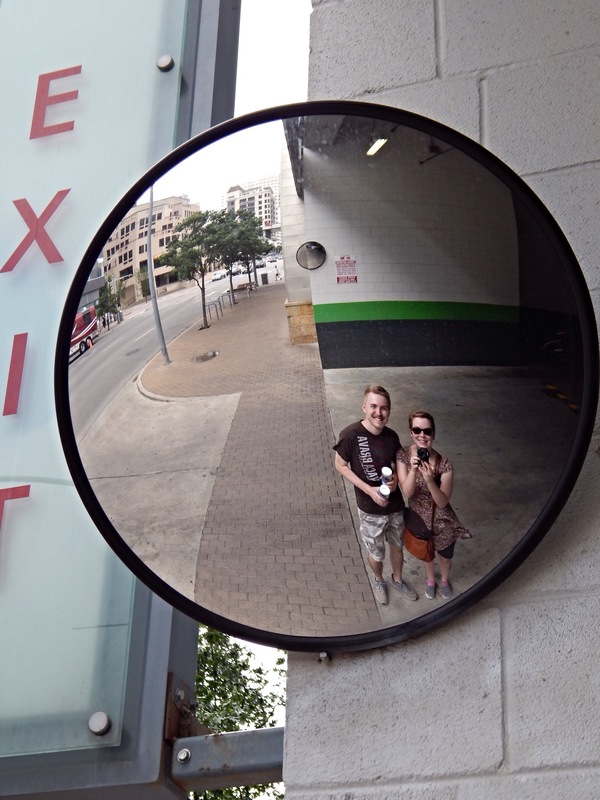 We had such an absolute blast in Austin, we were sad to leave. And even though we packed our days here to the brim with activities, I feel like we just saw a small fraction of what the city has to offer. We’ll be back, that’s for sure.